Content marketing in the form of emailings, branded websites, and editorial content was trusted by 50% or more of respondents to Nielsen's Global Trust in Advertising survey from Q3 2011. 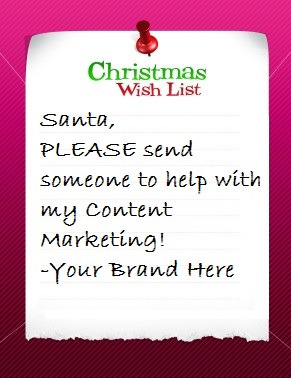 Christmas is almost upon us and this year there is one thing that business in the lawn and garden industry should have at the top of their marketing wishlist: Content marketing. What is content marketing you ask? It's valuable content that delivers high-quality, relevant information yielding measurable results without promotional push. It provides useful information to aid purchase decisions, improve product usage, and entertain consumers. And, it's more credible than advertising. In today’s advertising rich environment, fresh, engaging content has never been as important for businesses as it is today. People use the internet to research, compare and review products, and this information impacts buying decisions both online and in stores. You need content marketing regardless of whether your organization is a B2B or B2C. The one big reason is trust! 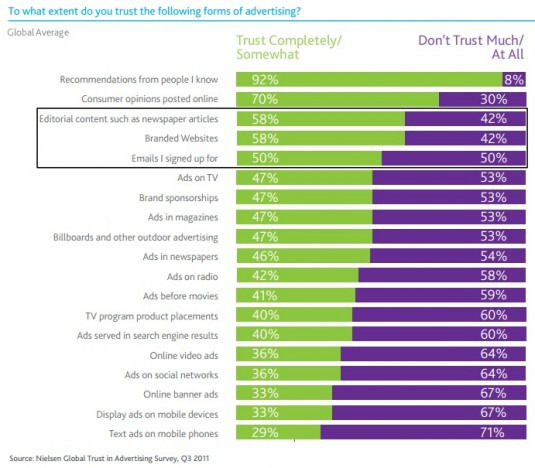 Businesses must use content marketing because consumers don’t trust advertising. Providing valuable, relevant content that tells a story, highlights your product or services, and establishes you as an industry expert is a powerful way to get found online, attract new business and build long-term relationships with customers. Content marketing is essential to help your company build an online presence in this digital age. Here are five tips to get your content marketing’s trustworthiness on track. Treat customers and employees with respect. Be open where appropriate about your firm’s business practices. Good manners go a long way. Remember customers observe how you treat your employees and others in their organization. Be transparent in your dealings. Keep confidential information private but where appropriate let employees and customers see how you do business. Show your organization is ethical in its practices. In a social media environment, it’s critical to act in good faith. Seek strong company representatives to create content and represent your organization. Use academics, technical experts within your organization, other consumers and regular employees to create and present your content. When using visual media such as video and photographs, make sure they reflect company positions in their dress, language and settings. Deal with a PR crisis quickly. Don’t let it fester. Act quickly and decisively before it controls you. Of course, this doesn't happen overnight. Creating a lasting relationship takes months, even years of proving yourself and your company. But don't give up! And, consider hiring Garden Media to help you maximize and create fresh and engaging content.